Luxury Apartment! Within Walking Distance From Aventura Mall! Hi Tech building in Aventura was built in 2008. Unit is located on 3rd floor with balcony and water view, Urban Style Loft 1 bedroom, 913 sq. feets (85 sq. meters), with 1 bathroom incl. bath tub and bidet, large size tiles flooring, top of the line appliances, walk-in closet and much more. 1 King size bed plus 1 sleeper sofa bed, portable crib. All linens and towels included. Washer & dryer inside the unit, stainless steel and granite fully equipped European kitchen, refrigerator, dishwasher, electric range and oven, microwave, coffee machine, water cooker, toaster, plates, glasses....... Central Air Conditioning. 1 indoor parking space in the building. Valet service available. Enjoy amenities in the building like designed lobby, pool, sauna, Gym, Wireless Internet access in the unit. Within walking distance from Aventura Mall! 5 min walk to Publix supermarket and 5 min. drive to Sunny Isles Beach. The kitchen was excellent we cooked very easily there and it had most of everything you would need it is a fully functioning kitchen with high end appliances. The living room area was spacious bright airy clean with a nice big television and it even had baby proof bumpers on the coffee table. We loved sitting in the balcony overlooking the water it is truly relaxing and quiet. The pools are nice and quiet too. The building itself is beautiful not too much traffic going in and out and it's located in luxurious area of Aventura with plenty of shopping around as well as AVentura mall and the highway was close by. The property came with a Parking space which was a big deal to me because a lot of the condos in that area are valet only. Overall I would definitely come back here the value that is offered is amazing it is a very convenient location and if you are looking to come in with the family go for it, I was initially worried that it would be too small but it was actually perfect size, I want to live there ! 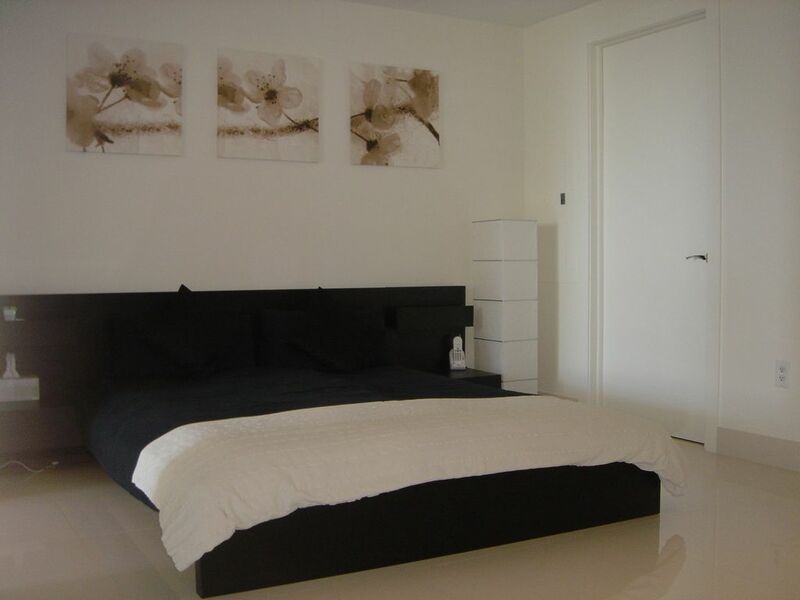 Really nice high quality apartmeant (clean and fresh) in a lovely area. Very good amenities and everything you need close by (resturants, shops, beaches). Nice and easy going host. Can really recomend this apartmeant, and will definitely go back! Beautiful condo, great location, well equipped. Excellent location, well-appointed luxury condo. I only stayed a few days but wished it had been longer. Luxury building with lots of amenities. Floor to ceiling doors and windows overlooking yacht slips on canal just off the Intracoastal Waterway (the condo is on the second floor). Very secure building with convenient garage parking. Supermarket about two blocks away. Great location. The owner lives in the building and was available for assistance at any time. Great bathroom with lots of towels (including beach towels). Very comfortable king-size bed. Great condition with excellent, high-end appliances. Very modern, euro-style features and furniture. Reasonable rental rate. I hesitated to provide this review because I don't want the condo booked up when I return! Flawless experience.